I'm on a mission to create an open-source clone of the Diablo engine. I've been looking at Stratagus as inspiration and I believe it to be possible. It also contains the Diablo engine in hopes someone can reverse engineer it. It's not the version we've been playing all along, rather a version that someone else made but hasn't released the source for it yet. I'm not too sure how difficult it would be, but I'm hoping someone from here at least knows who might be able to do this for us. I'm looking to release that source code in order to have mod makers create their own Diablo games and create a community around it. I want to see more Diablo games and this is the only way I can think of. Stratagus it's mobile port warcraft 2? Yeah essentially. It's an open source remake of the engine. I'd like to do something similar but for Diablo/Hellfire. If you haven't heard, this request has been created. I urge everyone to take a look at the code. It is by no means complete but he's accepting all pull requests. qualakon, freeablo is awesome project. I hope it will be successfull and work with PvPGN. It outlines some of the author's intentions and describes some of the file types. I know multiplayer isn't implemented yet. Perhaps you'd be willing to help him out with this? I'm not sure that I can help with coding of network implementation. First the game should already have a multiplayer support between clients. Then Battle.net support can be added, protocol is described on https://bnetdocs.org/. In this case it will work like an original Diablo (PvPGN is only an interface for chatting and join games). Other(additional) way is create standalone Diablo server, like D2GS for Diablo 2, to restrict cheating on a client side. 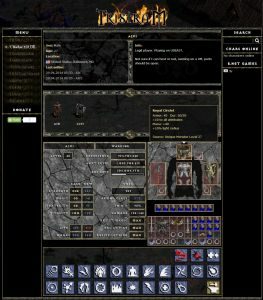 I'd love to have features like the character's save game is stored on the server rather than the client, a web interface to display character stats online etc and clans would be great. Looks like bnetdocs is going under renovations right now. I'll check it out though. I don't see any legal issues, Battle.net 1.0 is deprecated for Blizzard. They are focused on Battle.net 2.0. Statistics on a web site is really nice feature. For example here client-side stats used with a special program (like a launcher) tristr.am/characterdb.php. I don't know how they avoid cheating (or may be not), but it looks amazing. Tristr.am is a great site, goes along well with DiabloStats.